The curriculum of the ICT/Computing department in KS3 is designed to prepare pupils so that they make the correct decision in terms of their KS4 options subjects. In Years 10 and 11 pupils can opt for either GCSE Computer Science or the Cambridge National Creative iMedia course. Computer Science focuses on coding and computer hardware and software whereas Creative iMedia focuses more on the design aspect of websites, computer games and other graphical products. Pupils can attend Coding Club after school to pursue their interest in programming. Coding Club allows students to explore programming wherever their imagination leads them without having to satisfy an examination board assessment plan. Most nights pupils can avail themselves of coursework drop-in sessions to supplement their timetabled lessons. 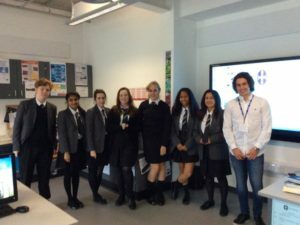 As part of the process of forging links between St Hilda’s and local businesses, entrepreneur Liam Mitchell from Breeze Development, a Merseyside digital marketing and web design company, was invited to speak to Year 12 BTEC level 3 IT pupils. Liam spoke on the subject of how businesses can utilise social media to improve their brand presence and how to formulate strategies to attract new customers. GCSE Computer Science comprises of three components: 01 Computer Systems, 02 Computational Thinking, Algorithms and Programming and 03 Programming Project. Components 01 and 02 are assessed via written examinations and 03 is a coursework unit. The Cambridge National Certificate in Creative iMedia comprises of four units: R081 Pre-production skills, R082 Creating digital graphics, R085 Creating a multipage website and R091 Designing a game concept. Unit R081 is assessed via a written examination and the remaining units via coursework. BTEC level 3 IT comprises of four units: unit 1 Information technology systems, unit 2 Creating systems to manage information, unit 3 Using social media in business and unit 6 Website development. Units 1 and 2 are assessed by written examinations and units 3 and 6 are coursework units.